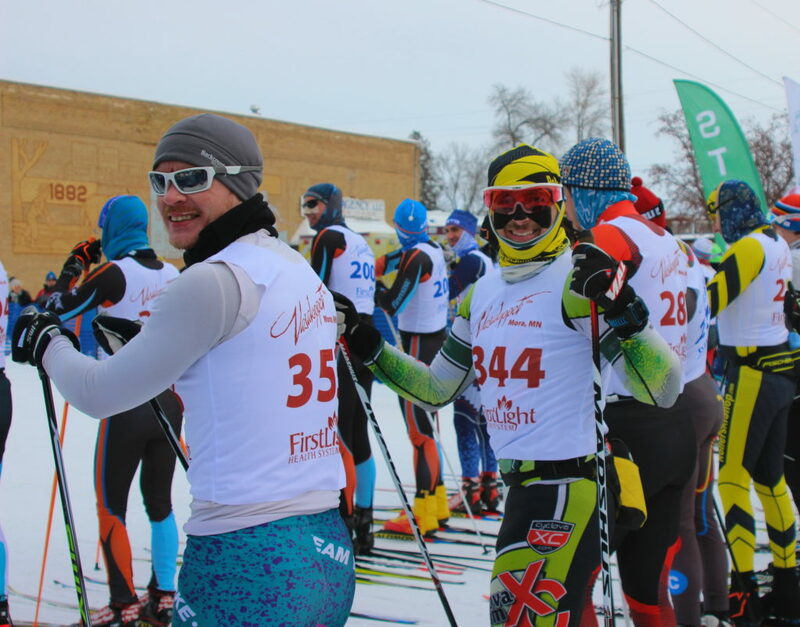 This is the last race report before the Birkie. This time I return to Mora for a chance to ski the long version of the Vasaloppet. Not the Swedish one obviously. The one made possible by farmers, snow farmers. Seriously. Mother nature came through in the end with some cold fresh powder, but the almost 18km loop was made possible by a bunch of hard working farmers blowing huge mountains of snow and spreading them all along the course. This report will follow the usual format. A little of the lead up, the race action (as best I can recall it), and then a little reflection and look ahead. Getting ready to start. Dennis Curran to my left who went on to finish 10th. This was not the ideal week of training. Immediately after the City of Lakes Loppet last Saturday I headed to the airport and took of for a 4 day conference in San Francisco. They have less snow than here which may not be too surprising. So I ran. For the first and second time in almost two months. To say my legs hurt would be an understatement. My Golden Gate run picture showed up in my last race report. 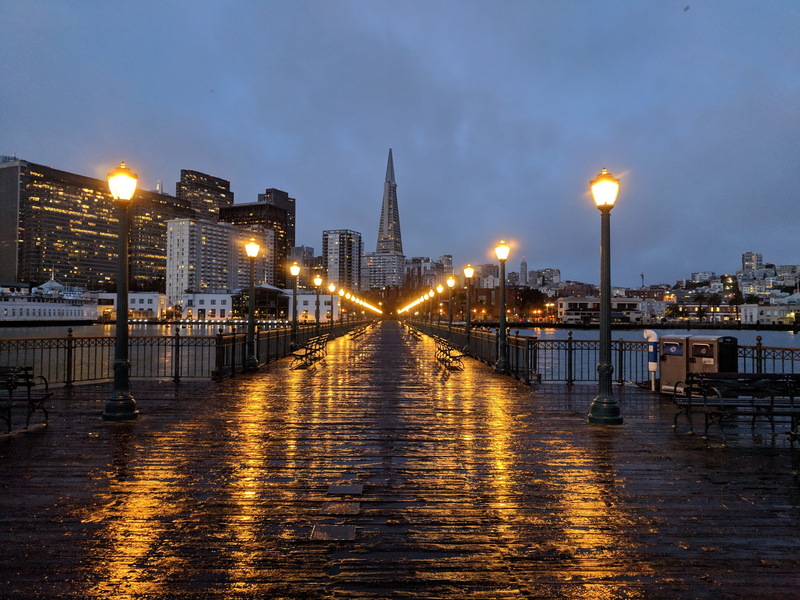 So here is the Transamerica Building instead. I did then opt for a recovery spin on the gym bike and a little time on the rower before taking a full recovery day on the final day in town. 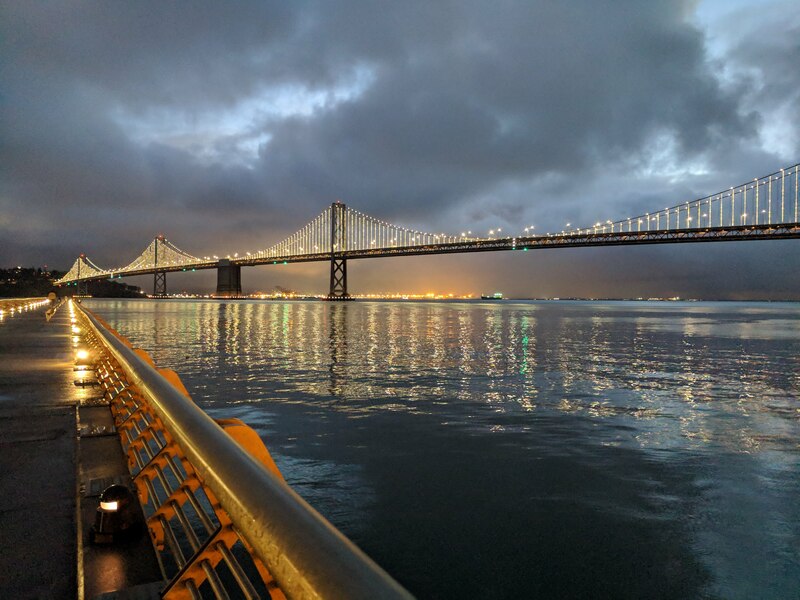 And the Bay Bridge for good measure. Thursday was full of catching back up on things at home, which included a Ski Erg that arrived while I was gone! So I didn’t have time to ski in the real snow, but I did get a chance to do some intervals inside. While it’s a bit too late for this to make an impact on this season, I think this is going to be a major factor for next year. Finally, on Friday we booked it up to Mora to do a little course preview and wax testing. Another cold one. And trying to listen to Jay and actually test instead of guess, I made up my own protocol and tested skis on course Friday night. The air temp at the time was about the same as it was anticipated to be by mid race. Aka about 0F. On my soft super cold grind Fischers I put Start Green on one ski and Start Green Graphite on the other. Then on my stiffer uni grind Rossignols I put a layer of Start Green and then one ski got Start MF10 and the other Rex HF31. 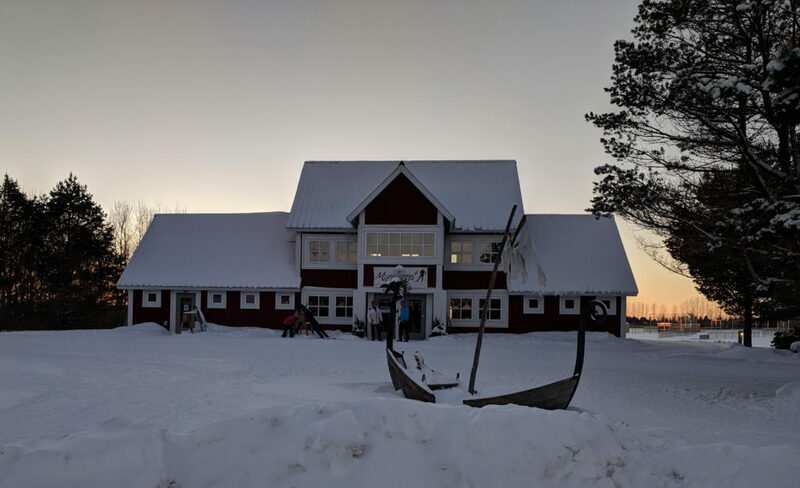 We skied around the Vasaloppet Nordic Center and I was trying to get a feeling for each of the different skis and see what the snow was like. The snow was much firmer than I was expecting. That led me to expect my stiffer Rossis to perform better. In fact I almost made an assumption that they would be better and almost didn’t do a sanity check between two different skis. A nice night for ski/wax testing at the Vasaloppet Nordic Center. Anyhow, on the Fischers the graphite was noticably better. Not night and day, but it was pretty obvious. On the Rossis the difference was hader to tell, but the MF10 felt slightly better. As I said, I was about to leave before I realized that I hadn’t put one of each ski on at the same time and assumed the Rossis were better. They were not. It was again pretty noticable that the cold grind Fischers were better. The trail wasn’t so hard that I was too worried about them being squirly on a firm deck. On race day they were a little squirly, but I don’t think that outweighed the speed difference. Long story super short, cold grind soft flex Fischers with Start Green Graphite and Start MF10. 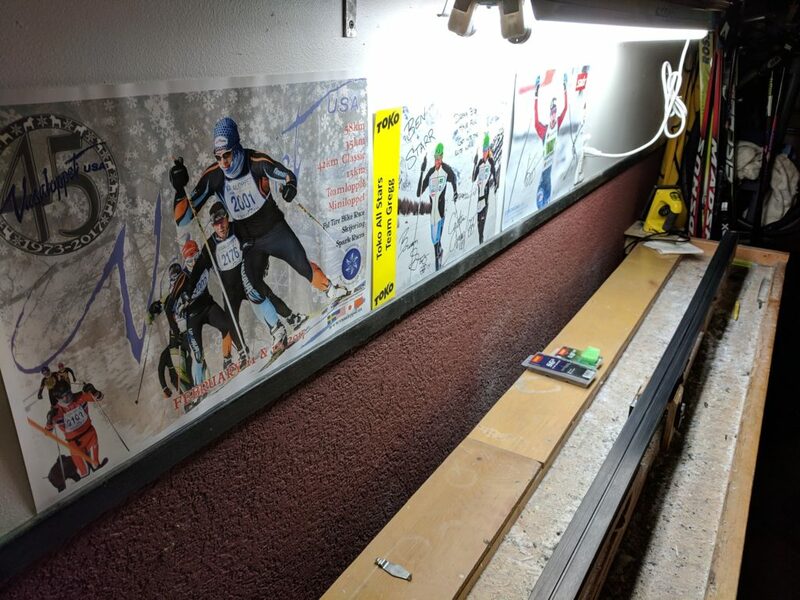 Just waxing skis being watch by myself in the Vasaloppet poster. I’m in there. Look closer. OK, racing. My wife snagged a sweet parking spot just 200m from the start line. 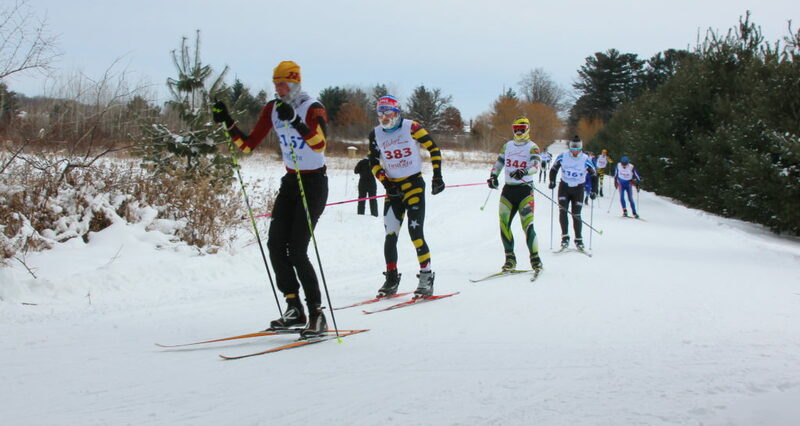 I was able to finish getting ready there and then just before the classic race started I was able to walk over and then set my skis down on the second row after the classic skiers took of. The start was pretty quick and I was all over the place. I almost biffed it right at the first corner and then several more times across the lake. I was skiing fast and in the same pack as Artie. But I knew that pack was just getting settled in and I was tense so I was on the back. Eventually I was off the back with two other guys and then about 4.5k in, just after the first aid station I had to let them go too. From there I was flying solo for the next 6k or so. During that time I was just working to relax a bit and let some of the tension in my lower legs out. 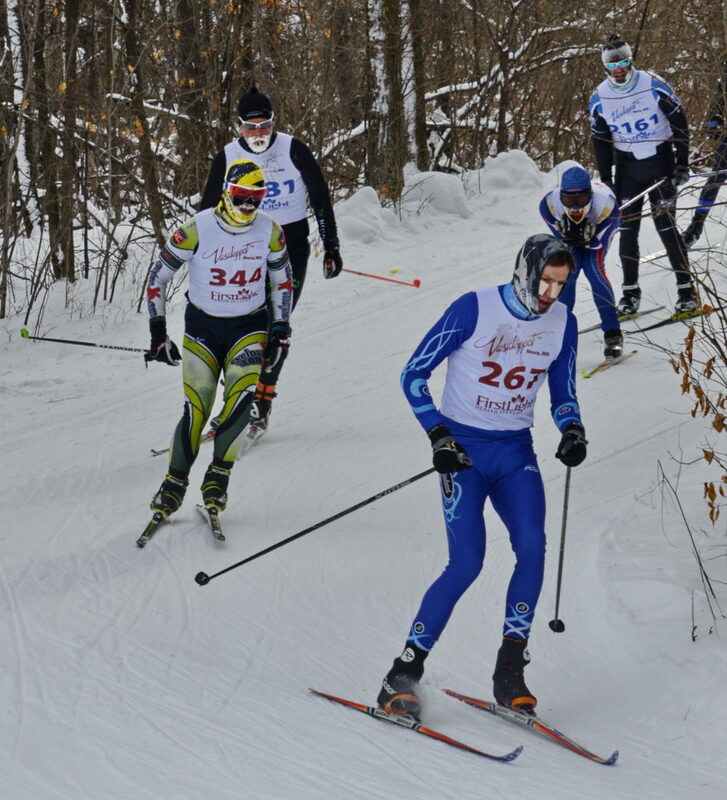 I eventually got swallowed up by a group of probably 6 guys including Jonathan Sanborn who I skied much of the 2016 race with. I skied with them for a while and then started being a little worried about being cold. Wind blocking Swix briefs, an extra buff, wind blocking Swix long jonhs, and my ski suit and still… cold. At the Noq I used a nice long downhill to pull the extra handwarmer out of my drink belt and put it in my ski suit. I had to do the same here, except there was no downhill to do that on. Instead I ended up taking my pole off, my glove off, and then making arragements, before getting all put back together again. During that escapade another pack swallowed me up. Now I was probably 15 skiers back from the front of the group I had been with and a small gap in the middle. NOT where I wanted to be. The trail really wasn’t wide enough to make passing easy if you were going similar speeds. It was fine for large deltas such as lapping folks, but not so much if you were just going a little faster. Coming past the Nordic Center the first time and making a push to get around the big group. I was concerned that the pace had been pretty easy at the front and someone was going to take it up a notch. Sure enough going past the backside of the Nordic Center Jon when to the front and now I was three groups back with Jon, Dave Nelson, and someone else gapping the rest of the original group that had caught me. The trail was a little wider there so I made a push to get to the front and by the time we made it through the aid station in front of the Nordic Center Jon was up the trail, but two UofM guys and I had caught back up to Dave. One of the UofM guys took the pull along the length of the lake and we were moving pretty good. It was just at the end of the lake where Pete Woeste made his first appearance of the day. He went to the front and stayed there. And I do mean stayed there. I was sitting third or fourth wheel and Pete just sat on the front… for about 15k. In discussions post race he did make a few offers to let someone else lead, but the UofM guy(s) weren’t taking the hint. We talked about pulling over and standing up after the race to force their hand. Then again, I was sitting back there not offering up my services either, so maybe I shouldn’t talk too loudly. This is getting back into the Nordic Center trails and Pete is out of frame left leading the train. Mid second lap on the far north end of the trail system. Pete is again out of frame right leading. Jon Sanborn is behind me having received a replacement pole at the last aid station to replace one he broke. Almost the end of lap 2 here. Pete still leading… but Jon is about to go to the front because he is almost done with his 2 lap race. In any case, I finally took a turn on the front as we headed onto the lake for the second time (well third, but the second time we got on from that direction). I can’t remember now who took the lead the length of the lake. It wasn’t myself or Pete though. What I do know is that steep two lane climb on the east end of the lake I chose the slow lane. 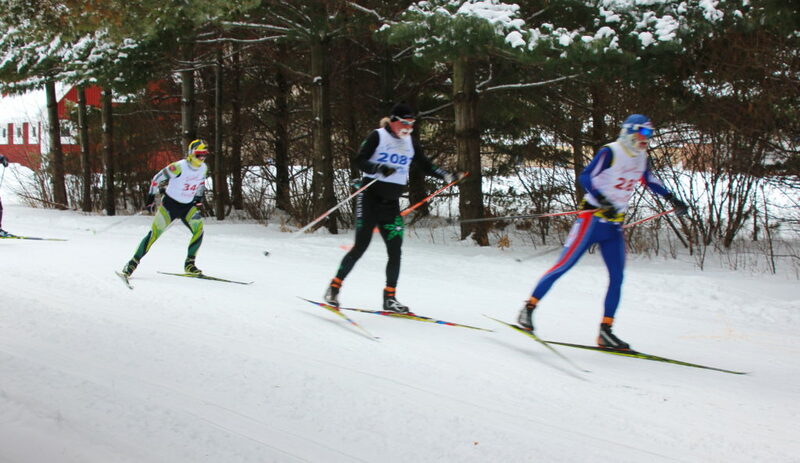 There were a few skier being lapped climbing the hill and I took the inside lane thinking it would clear faster. It did not. Pete, Dave Nelson, and a couple of others took the outside lane and by the time I got to the top of the hill they had a nearly 10 second gap. Crap. Thankfully I felt my skis were running good and was able to get back onto the back of the train shortly after shooting back down onto the lake again. Somewhere around the time we got onto the Nordic Center trails again Dave Nelson and the lead woman Felicia Gesior took off. I stuck to Pete and Pete let them go (which was good, because I was starting to feel crampy in my triceps). Pete again did a killer pull doing another 10-12k on the front. Shortly before hitting the Nordic Center for the last time Yaroslav Perventsev came flying past. And promptly spun out on a corner and crashed. But then just a k or so later went by again. Piotr Bednarski, who we had picked up somewhere midlap went with him. I tried to take a pull in front of Pete and stay with them, but could not. I was really feeling it at this point and just a little elevation in the percieved speed felt like a huge elevation in effort. 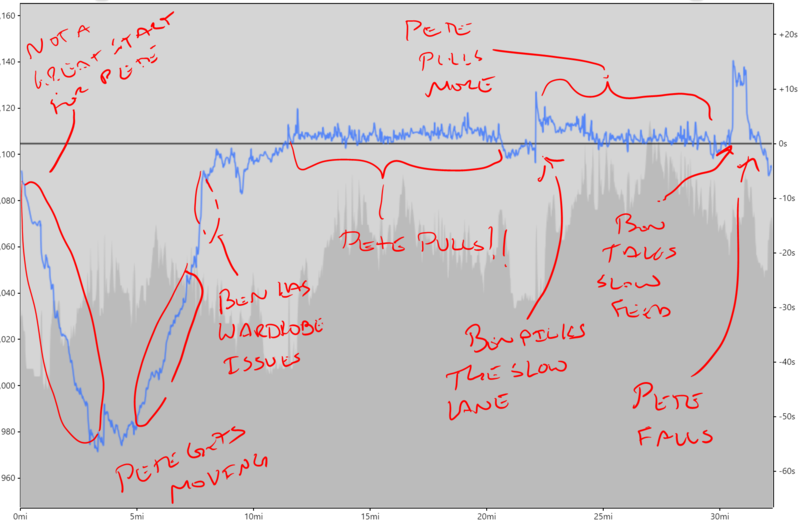 Here is an annotated Strava Flyby showing Pete’s time relative to mine. Sorry for the poor pen quality. Going through the last aid station Pete got a good gap on me. I stopped for a gatorade and my first cup of soup. And also got my ski slightly tangled between another skiers feet. By the time I got out of there Pete was probably 10-15 seconds up the trail. I was able to hold the gap for a bit and then Pete stumbled and fell which allowed me to catch up again. When we hit the lake I went to the front and dumped what I had left on course. I almost went a little too early because I was fading hard coming around the last corner to mainstreet and the finish. In the end, after letting Pete pull for probably close to 30 k I beat him by 6 seconds. Some friend I was 🙁 We’ve talked since the race and will again before the Birkie. As you’ll see in the analysis below we are both right on the bubble this year. I think we can work together for a great shot at making the Elite Wave. 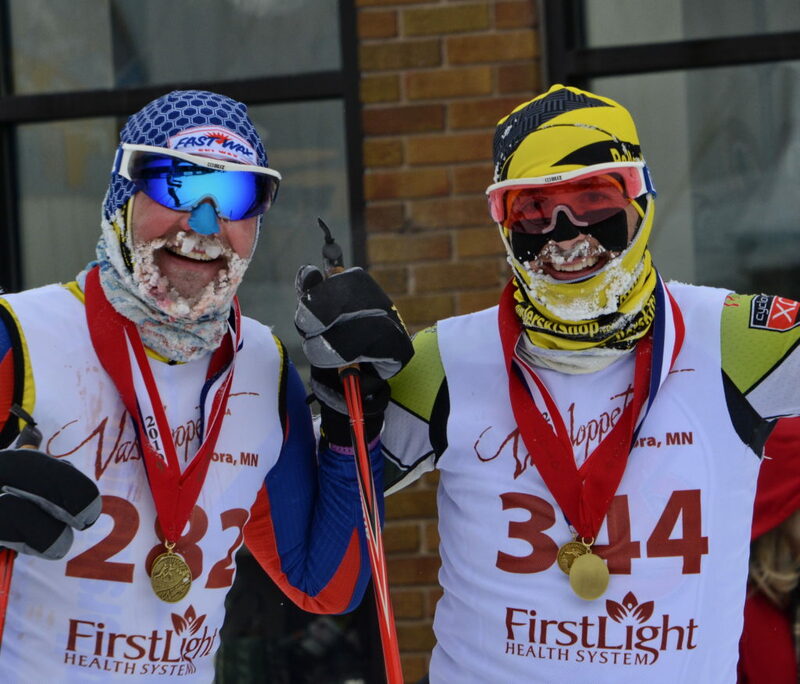 Me and Pete frosty at the finish line. Final time 2:44:17 for 27th overall, 26th male, and 9th in the 35-44 age group (after removing Matt Liebsch who won). I feel decent about this race. Unmentioned above, but I did make a focus on eating more and was able to get two gus down but only half of my bottle of tailwind. I probably need a little more than that and it should start earlier than 1:10 into the race. Though I was feeling crampy and bonking the last few km, I didn’t totally bonk. I do feel like I should have been more vocal in the race and worked with Pete. Instead I was being too conservative out there. While I wasn’t able to elevate the effort at the end, I feel like I could have carried a higher effort earlier in the race and still kept the same at the end. My HR has been running WAY lower than it has been in the past year. I’m probably averaging 7-10 bpm lower on the marathon races. Not going slower I don’t think. But should I be able to push the HR up and go faster? Without bonking at the end of course. The only thing worse than what my Birkie Predictor said, is to actually get that on Birkie day. 201st? Really, the first guy to not make the Elite Wave? Ouch! Another interesting look is at the lap times. The first one was the fastest which isn’t surprising. What is surprising though is the drop off in the last lap. My recollection is that it felt hard, but maybe I’m conflating worried about cramping in my triceps with aerobically hard. The HR was definitely trailing off, which could be a sign of bonking, which would be consistent with my feelings in the last 20 minutes. Hmm, some stuff to chew on. It’s almost taper time. I have no plans to race this weekend. Just the Wednesday night races and a few more sharpening interval sessions. Those are mostly to keep things working, and mentally sharp, not for any training effect. Someone check my temperature. I’m pretty sure I have a fever. Birkie Fever.